Märklin (Gebr. Märklin & Cie. GmbH, MÄRKLIN, MAERKLIN) is a German company based at Göppingen in Baden-Württemberg. The company was founded in 1859, and originally specialized in doll houses and tin toys. 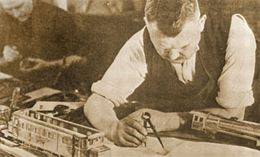 Today the company is best known for model railways and technical toys. In some parts of Germany and Europe, the company’s name is almost synonymous with model railroads. 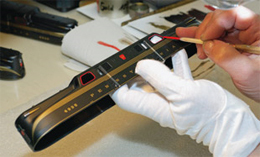 Märklin is credited with the creation of several popular model railroad gauges and scales. As far back as 1891, Märklin defined gauges 1-5 as standards for toy trains and presented them at the Leipzig Toy Fair. They soon became international standards. Märklin followed with 0 gauge (by some accounts as early as 1895 or as late as 1901), H0 scale in 1935, and Z scale in 1972. 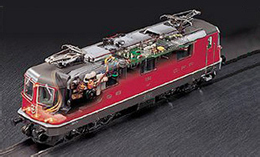 The Märklin system has some incompatibility with other manufacturers’ H0 trains. Because the wheels on Märklin’s cars are not insulated, it causes shorts if its cars are used on other manufacturers’ H0 track without changing the wheels. The profile of the wheels are also different (see also NEM 340). Over the years, the Märklin marque became valuable to model train collectors, some of the very early models fetching impressive prices at auction. The range of products is extensive, and collectors also pay attention to packaging that were used for the products. Collectors also look for rare and hard to find models, such as the SBB Crocodile model, the AMTRAK ICE model, the Western Pacific ‘California Zephyr’ model, and the famous Union Pacific Big Boy model, among many others. On 11 May 2006, the company, which had until then been owned by the three families Märklin, Friz and Safft, was sold to the British investment group Kingsbridge Capital, with the support of the employees. In 2007, the company expanded its product offering by buying the remaining assets of the bankrupt firm, Ernst Paul Lehmann Patentwerk, who owned the LGB brand and product line of G scale model railways. On 4 February 2009 Märklin filed for insolvency at the Göppingen municipal court. A year later, on 5 February 2010, Märklin announced a return to profitability.